Alexandra McArthur is a resident of the Paramount condos in Glenwood South, Vice-chair of the National Disability Institute (NDI) Board of Directors, and Director, Young Adult Community Engagement at the Muscular Dystrophy Association. Alex is launching a grassroots campaign DISABLE POVERTY to generate awareness about and promote action for the issue of poverty and disability in America. An Interview with Alex, by Donna Belt Even meeting you briefly Alexandra, your energy and drive quickly challenge assumptions about the limitations of a person with a disability. Your work in social innovation and advocacy took you to the White House (as a 2014 White House Champion of Change for Disability & Employment), and most recently, you’ve adopted a position that entails travel around the US building a program for the Muscular Dystrophy Association. How have your personal and professional goals been shaped by challenges and insights from your journey with Muscular Dystrophy? Thank you, Donna. I have been given incredible privileges throughout my life, particularly my education, access to assistive technology, financial capacity, and my network of supporters. I recognize that there are millions of people, with and without disabilities who have not had the same opportunities. I’ve always asked “how can I do the most good”, which has guided my professional trajectory from leadership development in higher education, to corporate social responsibility, and now to advocacy and nonprofit management. At age 28, that may appear to be a lot of professional pivots, but as a person with a chronic illness, I know that I may only have so long to make my impact. Over time, it’s become clearer that “doing the most good” for me entails advocating for people with disabilities. People with disabilities too often face low expectations, inaccessible environments, and systemic barriers. However, it’s also a very exciting time to be working on issues related to disability. Young people with disabilities are growing up proud of who they are, including their disability and it’s more common to see disability as an asset rather than a liability in any setting, including the workplace. I want to be a part of changing perceptions related to disability, in addition to providing solutions that can help unlock the talents of people with disabilities. Having recently moved to Raleigh from NY City, how would you compare Raleigh’s downtown streets and businesses with NY’s, when it comes to accessibility? What practical changes could businesses adopt to make their buildings easier to navigate? Are there changes that the city could make to sidewalks and crossings that would offer greater accommodation to residents and visitors in wheelchairs? 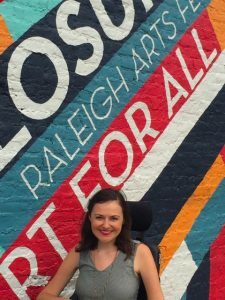 Raleigh businesses are generally more accessible than shops in New York City for individuals with disabilities. Usually entrances are step-free and I’ve been pleased to find curb cuts on nearly every corner. For businesses who want to improve their accessibility, be sure to consider the experience of people with disabilities as they navigate your store or restaurant. If you were in a wheelchair, would you be able to open the door to get into the shop? Is there enough room to move in between merchandise? Do you offer some lower tables as seating options? Do you have a braille menu or have you trained staff to verbally describe menu options to someone with low-vision? Is your website optimized for someone using a screen reader? People with disabilities and their families represent a $1 trillion dollar market and businesses who are welcoming and inclusive of this population, including hiring people with disabilities, will tap into this often-overlooked customer base. One of the ways that I hope Raleigh will continue to improve its accessibility is by passing the transit referendum in November (vote yes on the last question on the ballet!). Improving our public transit will ensure that folks who don’t drive, like myself or people who would rather not drive, like many millennials, still have access to the great variety of events, shops, and services that this area offers. What brought you and your husband, Owen to downtown Raleigh, and specifically Glenwood South? What have you enjoyed the most since moving here? After 5 years in New York City, my husband and I were ready to settle down in a place that was a bit slower pace, but still had a vibrant culture and food scene, and interesting job opportunities – Raleigh fit that bill. We were fortunate to find a condo in Glenwood South, as being able to walk to restaurants, shopping, and downtown was critical for me since I do not drive and as Raleigh’s public transportation continues to develop. My favorite thing about the area is easy: the people. There is something incredibly special about a location where people choose to come, choose to stay, and choose to invest. Unique initiatives, such as the Poetry Wall and the countless public festivals to one-off conversations with small business owners, have shown me the vibrancy of this area and the commitment to building an inclusive, welcoming community. I know that these initiatives happen because of individuals’ love for this area, their work, and each other and I’m thrilled to be joining this type of supportive community. I understand that you’re launching the DISABLE POVERTY campaign, as well as focusing on working with government leaders to understand the voting power of those touched directly and indirectly by disabilities. Yes! Too often, people with disabilities are left out of the conversation. I think much of that is due to the unrecognized political and financial power of this population. People with disabilities are 1/5th of our country, and yet people with disabilities make up less than 1% of members in Congress. In addition, adults with disabilities are twice as likely to live in poverty than someone without a disability. These statistics are startling and are interrelated. The Disable Poverty campaign, spearheaded by the National Disability Institute, (www.disablepoverty.org) aims to increase awareness awareness about the link between poverty and disability, and the public policies and benefit systems that often limit employment opportunities and upward financial mobility. On the local level, I am hosting an event to spur a conversation about the need to include disabled voices in the political process. Election season is the perfect time for this discussion. Presidential candidate Hillary Clinton has made unprecedented efforts to address issues of disability on her campaign. She included disability advocates as speakers at the convention, unveiled comprehensive plans for autism education and mental illness supports, and she has people with disabilities included as her advisors. 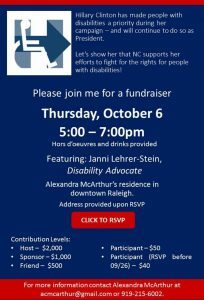 My event on Thursday, Oct 6, will bring together advocates, a member of the campaign, and local leaders to discuss how we can replicate this type of inclusive campaign and encourage participation of people with disabilities within politics in NC. If you’re interested in attending, please purchase a ticket here.